Power tariffs will not rise after the Goods and Services Tax (GST) regime gets implemented from July 1, Union Power Minister Piyush Goyal said on Thursday. "We don't foresee any upward impact on power tariffs from the GST," Goyal told the media here following a meeting with 75 industry associations. "All the sectors had technical issues about the GST, which have been largely resolved across the table in this meeting, except two issues where more consultations are required." Goyal said one of the unresolved issues concerns fly ash, which is an environmental friendly product, but the ministry was not in favour of a separate classification for it under the GST. The other issue was a dual slab rate structure for cable industry products, which may require a re-look. 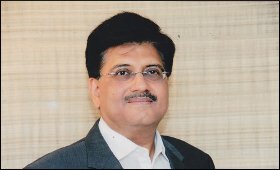 To a query whether the lower GST of 5 per cent on coal would help reduce power tariffs, Goyal said he would meet the forum of regulators on Friday to discuss ways to transmit the benefits of tax reduction to consumers. He also said the industry was enthusiastic about the transition to a more transparent tax regime that would be the "biggest reform that ever happened in independent India". "Not a single participant at today's meeting requested deferment (of GST implementation)." Goyal said, "Under GST, the assessee will only have to enter the sales invoice... after that all the returns are auto-populated." "Any transformation of this nature will have teething problems and require a transition period," he added.